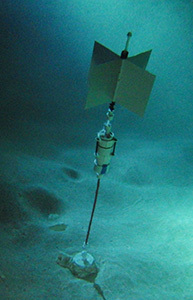 A float configuration deployment with flag on one of the deep saline units. In March we did an experiment by adding small flags to some of our flow sensors to enhance their response in low flow situations. As with so many of the things we have tried on this project, these thin sheets of ABS were the best solution I could come up with that would (1) flat pack into our luggage and (2) be assembled in the field with zip-ties. One of my pet peeves with commercial equipment is that much of it fails the suitcase test, which can be an important part of trip logistics. Now, I’m not even going to pretend I have the kind of skills it would take to estimate drag on those fins, which present a progressively smaller surface as tilt angle increases. In fact, I probably know less about math than I knew about electronics when I started this project. So everything that follows here is just me just muddling through like always. If you actually do possesses those skills you should probably look away now. I’d hate to be responsible for another academic drinking themselves into oblivion, while muttering about the internet being taken over by monkeys. Without an expensive accoustic dopper unit to calibrate against, the best we could do was develop an empirical relationship between the new design and old ones. So we installed one of the “enhanced” flow sensors beside a similar unit with no flag. 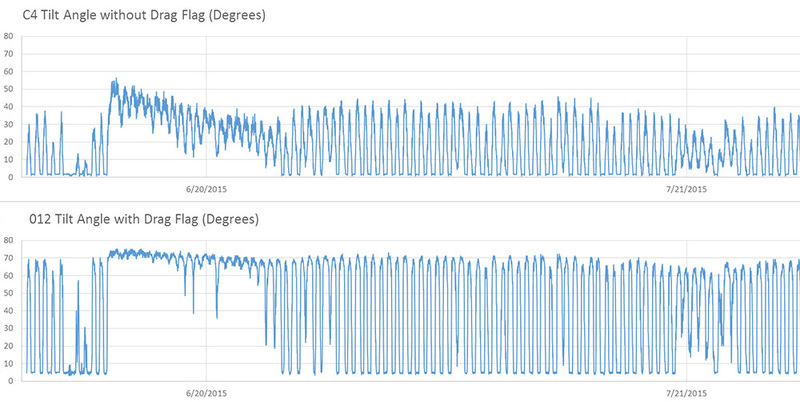 Comparing the two data sets would show us how much the flag was increasing the sensors response to water flow. Since we had no idea what that low end amplification would actually turn out to be, we used a tidally controlled coastal outflow that went from zero flow to peak velocities above 10 cm/s twice a day. My first impression was that the boosted diurnal response looks like the kind DRC plank that smacks you over the head whenever you turn on a radio these days. The low end is being boosted by a huge amount, in fact, just before the event there are some spikes in the flagged data there that don’t don’t even rise above the noise floor on the “naked” flow sensor. Just looking at those tells me we had between 3-4x more signal at the low end. But how do I quantify that? Note: Logger #012 had the drag enhancer attached, while C4 had no flag. The loggers bodies themselves presented very similar, somewhat spherical, profiles to the water flow. My newer builds are cylindrical, which opens another whole can of worms. I was happy to see that the low end boost looking so linear and I wondered if that elbow was some kind of turbulent flow transition. Who knows, perhaps when the loggers approached sixty degrees the fin even starts to contribute some lift. (?) 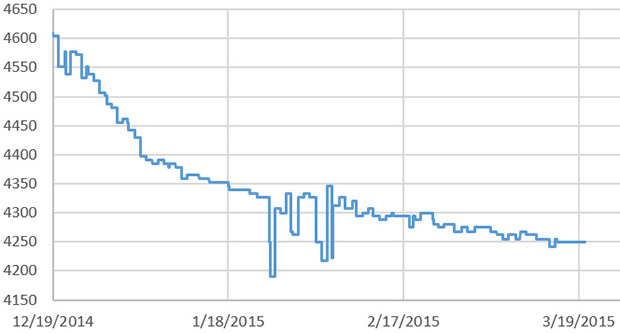 But in terms of relating one units response into the other, even I could see that Excel’s trend line was terrible. 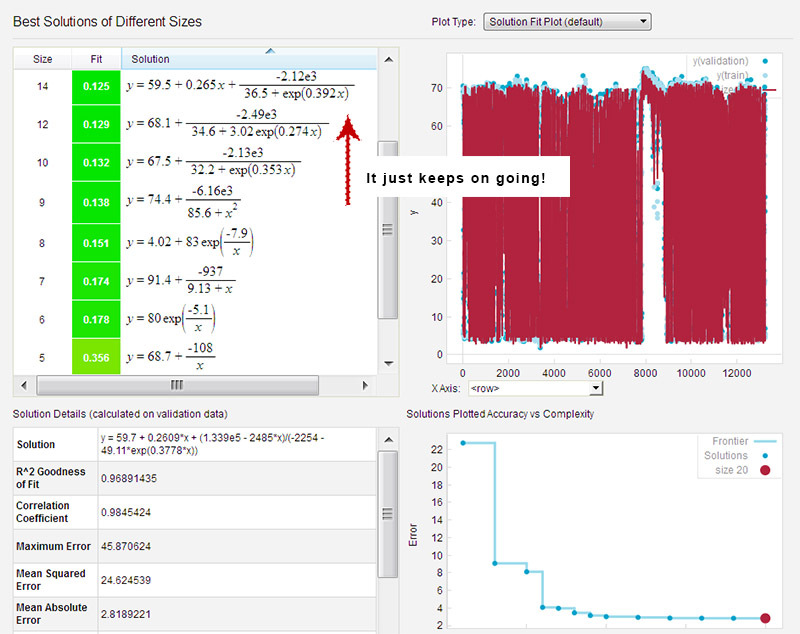 You can do better with the solver plug-in, but you have to know the equation you want to use first. If you don’t know what the formula is, it can be a tedious process to figure one out from scratch. So I went looking for something that would give me a better way to model that relationship. 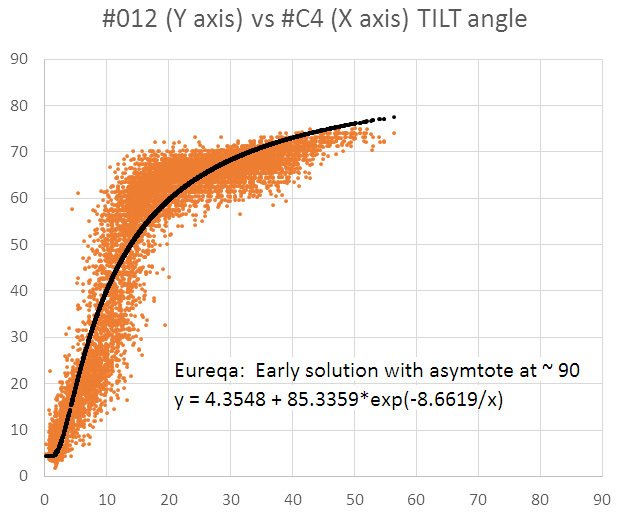 That plot looked like a distorted “S” shape, and google image searching lead me to the entries on logistic functions of the form: f(x) = a / (1 + b c –x) These sigmoidal curves start out with a low slope, which increases to an inflection point, then levels off as they approach a maximum value. They pop up frequently in natural systems when people try to model population/cell growth, or EC50 dose response. 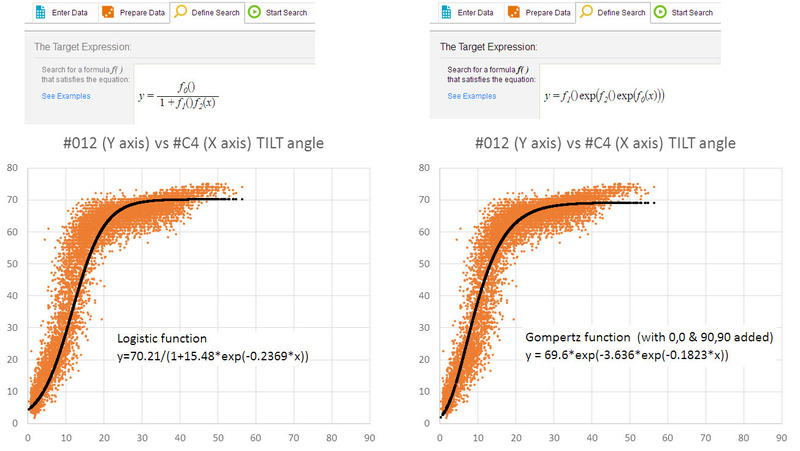 The Gompertz function was a long-tail variant that also looked like a good contender. First pass with Eureqa: meh! While I was digging through all that, I came across references to a statistical modeler called Eureqa that was developed in Cornell’s creative machines lab a few years ago. I’d seen mention it before in the geek press, but this was the first time that I had a situation where it might be useful to me personally. So I downloaded their free trial version and day-am! This slick bit of code made me feel like a ten year old who’s been left alone in the cockpit of some large piece of earth moving equipment that still has the key in the ignition. Clearly this was a tool for real scientists, and I should probably wait for that adult supervision. But…well…I’ve been failing that kind of marshmallow test for quite a while now. Now that’s starting to look better, and I was not selecting the very “best” solution according to their fit metrics. If you leave the solver running for a long time (say, while you go have dinner…) it just keeps chugging away, adding coefficients until you have something large and ugly. But I am sure that if I actually knew what I was doing, the correct solutions would jump right out at me. The press often overlooks this critical step with their hyperbole about Eureqa “replacing” scientists: the real world is not a simple pendulum: it’s a warm, squishy, mess that involves a lot of value judgment. And…Happy Birthday to my brother Mike! As a seasoned Linux system bender, he was one of the first people to bring the Arduino / Open Source Hardware phenomenon to my attention. And he is also someone who knows how absurd it is for me to post on anything mathematical. 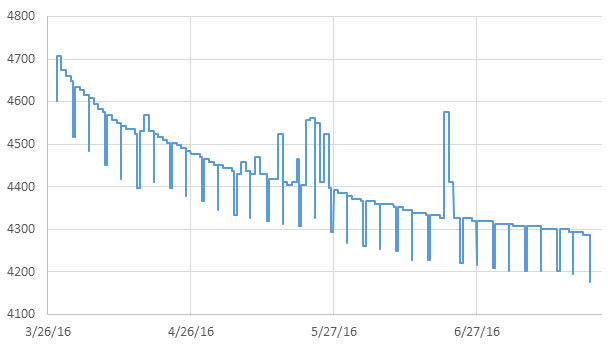 This entry was posted in Developing a FLOW ≋ sensor, Test results & Data analysis on September 3, 2015 by edmallon. There is an old saying that goes: “Yesterdays solutions are today’s problems” and I think that now describes this project. You see the first year of development was focused on pretty straightforward hardware issues, and solving each one produced significant gains in performance. 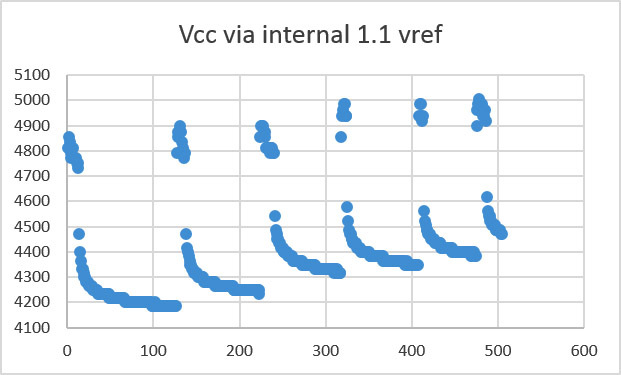 Now that I am consistently seeing sleep currents in the 0.1-0.2 mA range (with an SD card (~80uA) & live Adxl345 (~50uA) along for the ride), I am hunting for more elegant ways to extend the operating time while maintaining the simple three component core of the original design. With a 3xAA power pack now providing almost a year of operation for some sensor configurations, I also have the task of developing a method for testing the loggers that can discriminate between subtle code changes with relatively short runs. But artificially reducing the sleep interval between samples distorts the result enough that it’s hard to make good projections. I am slowly coming to realize that testing & calibration are the real heavy lifting when you build any new device. The new A544 cells arrived at > 7 volts which was too high for the regulator on the Ultra. So I took them down to 5.6 volts with a Zenner that stops the discharge before it goes too far. 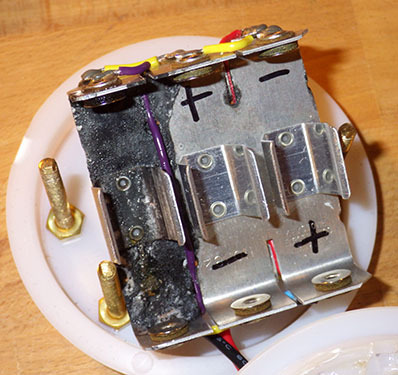 The rare earth magnet soldered to the leads gets zapped by the heat from the iron, so you need a second little magnet to hold each battery connection securely. Each new trick I try, like finding another place where I can put the cpu to sleep, adds complexity to code that has “once per day events” and “once per week” events, and soon there will be “only if the delta between two readings is greater than x” events. Most of these are so short that a multimeter can’t catch them but even when a friend donated an old Tektronics to help me try to get a handle on the duty cycle, I faced the challenge of displaying currents ranging from less than 0.1mA to 80mA SD writes with variable duration. To make things more interesting, some of the cheap sensor boards I have been noodling around with have components of unknown origin & dubious quality, which introduce yet another set of variables. Even with my mediocre scope-skills the forums had convinced me that the SD card was the elephant in the room. So I tried to avoid SD use by adding an external 32k eeprom which let me buffer five or more days worth of data before having to fire up the external storage. Problem solved…or so I thought. I was quite surprised by data from the last deployment that showed using this approach to reduce SD writes by a factor of five only delivered a 5-10% improvement overall. I had overlooked the fact that the AT24C256 eeprom pulls 3mA for five milliseconds per pagewrite. This was nearly as much current as the Rocket Ultra I was using, not to mention a significant extension of the cpu uptime for multi sensor units that were buffering up to four eeprom pages per record. All of that activity adds up. Rocket Ultra (left) VS Moteino Mega (right) based data loggers with pin powered RTCs and 2×4.7MΩ voltage dividers monitoring both the power supply voltage and the rtc backup battery. I break out LED, I2C and one-wire with Deans micro connectors, and you can see a 4.7K one-wire pull-up above the main divider on the Mega. A 32K eeprom is tucked away under the rtc breakout, which I flipped over on the Moteino build to make it easier to change the CR2032. For a standardized test, I set both loggers buffering 96 records (= one day @ 15min intervals) in drip sensor configuration. I added the I2C eeprom to the Moteino logger to make the builds as similar as possible, but it does not get used. Instead I store the raw sensor data in integer arrays. So there is no Pstring/ascii use on the Mega logger until I write the data to the SD cards. With matched acclerometers & cards, both loggers sleep at 0.18 mA so the the only difference between them should be the data handling. One thing I did not catch from the LowPowerLab specifications was that the 16mhz Mega draws ~12 mA (while awake) in this configuration as compared to the Ultra builds which perk along at just over 4mA. I figured that with SRAM storage the mcu up time would be so much shorter that it would not matter. With a parallel bank of super caps to buffer SD events, you can drive the loggers with small batteries that have high series resistance. 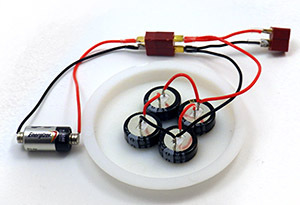 Rare earth magnets let you connect without a holder and you can build multi-layer magnet/button cell stacks to create low power options at different voltages. Those are 5v 1farad supercaps so I don’t bother to balance them as they should be able to handle any leakage asymmetry when the battery input is only 5.6 volts. The graphs below had no low volt blips at all, so this series/parallel arrangement of 4 of them was probably more capacity than I needed. I still had not sorted out the oscilloscope issues but I realized that I could flip the problem around: instead of struggling to display the effect of every little tweak to the duty cycle why not provide a fixed amount of power and just see how long the unit runs. It’s a data logger, so I already have a time stamp and a battery voltage reading with every record. 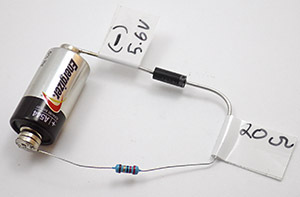 A couple of people suggested capacitors, but even a 1F supercap only gives you about 0.27 mAh per volt, translating into a few hours of operation for my loggers. I needed longer runs than that because the Moteino was going to loose the data in it’s sram buffer when the unit browned out (I can always dig into eeproms later for the last few records on the Ultra). A bank big enough for multi day runs was going to be expensive, and is probably a hazard for my little bots. Fortunately there are a host of small form factor batteries out there for things like fire alarms, medical devices, etc. Energiser’s A544 seemed to fit the bill at 6 volts & 150 mAh: promising to power the Pearls in “sleep current” mode for about 40 days. Even better, they were alkaline cells, so their discharge curve would be more like the AA’s used in real world deployments. There was some risk that these little cells would drop to the low voltage cutoff when the SD write current spikes occurred, so I added a few super caps to buffer those loads. I then set the units up on a book shelf where they would not be triggered and waited for my “baseline” load result. I was sure the SRAM buffering Moteino logger would come out far ahead of the Rocket build that was sandbagged by all that I2C eeprom traffic. 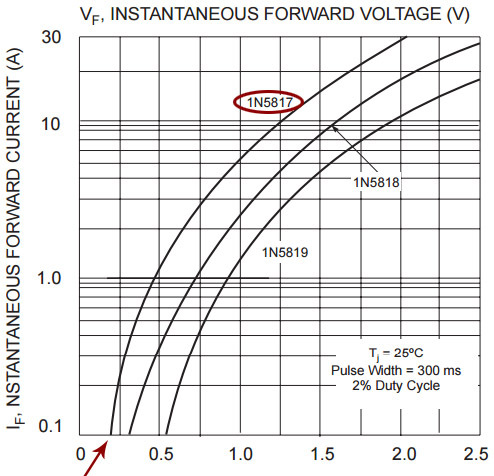 But if you correct for the slightly higher starting voltage those two curves are so close to each other they might well have come from the same machine. So there is no longevity boost from SRAM buffering if I use an mcu that draws 3x as much current, but at least I now have a good way to test the loggers without waiting too long for results. This result also agrees with some of my earliest drip sensor results which hinted that the sampling/buffering events were consuming 2/3 of the power budget. For the next round of tests I will put them on the calibration rigs to see how the A544’s handle the interrupts being triggered all the time. Presumably the Moteinos will draw more power there so I will need to normalize the results to match drip counts. To go beyond the conservative one day buffering I will need some way to capture data from the SRAM buffer before the units power down, so perhaps I will end up using the eeprom on those Moteino Mega builds after all. We will use a few Mega based drip sensors set for very long buffering (8-10 days?) on the next real world deployment. I also have a feeling that the DS18B20 temperature strings would benefit more from SRAM buffering than these simple drip sensors, as they poll up to 40 sensors per record. That’s a lot more data to shuffle around. Hackaday just posted about [Majek] putting “live” data into Arduino’s flash ram (which is normally not accessible after startup) via a Optiboot hack. This opens up another possible data buffering strategy, though I am not sure if it could handle the duty cycle of a long deployment. Or it might let you do calculations with the 328p that would otherwise run out of space. So this is an interesting development that involves no extra hardware, which is usually good news for the power budget. I had already been wondering if calibration data could be stored in flash with Progmem, but that solution only works for data that is not changing all the time. We finally have some data from the first field deployment of Moteino based loggers which store sensor readings in ram (array variables), rather than buffering all the data as ascii characters in an external eeprom like my 328p based loggers do. And here is a directly comparable build using a rocket scream ultra with a slightly higher drip count (ie: number of processor waking events) over the duration of the deployment. 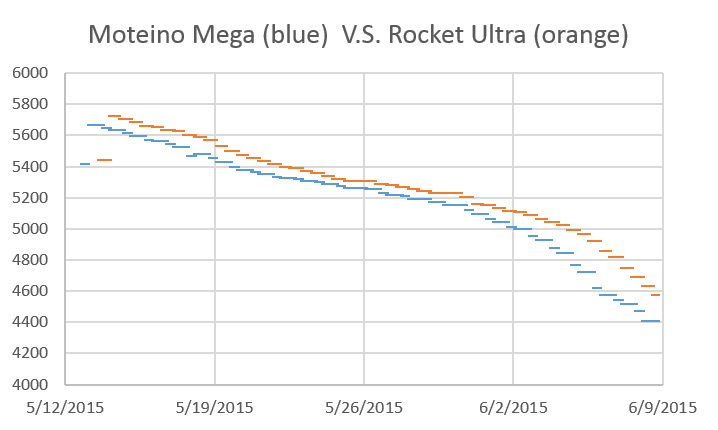 So once again, these performance curves are so close that it makes no odds. But on the bright side, this confirms that accelerated testing with 150mAh A544 batteries does give me results that translate into real world. So this is still pretty good news even if the 1284’s did not deliver the magic performance bullet I was hoping for. If I wanted something a bit beefier than the 150 mAh in the A544’s, I could hack my way into a 9v battery, and use half of the set of 500 mAh AAAA batteries you find inside. That would give me about 1/4 the power of the AA batteries I typically use on deployment. I’m quite tickled about being able to replicate a task that you normally would need an oscilloscope to see. Of course my chances of actually catching one of those big unpredictable SD card latencies (from something like age related wear-leveling) is still pretty low, so I will continue to use this A544 method for solid longevity predictions. 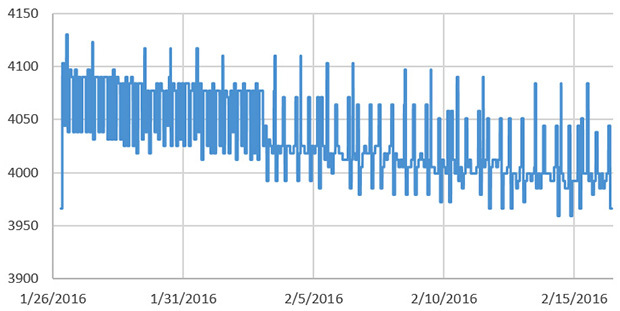 This entry was posted in Lessons learned., Reducing power consumption, Test results & Data analysis on June 28, 2015 by edmallon. The more I thought about it, the more the high power drain of the flow sensors got under my skin. How had I misjudged the performance that badly, after so many successful bench top tests? I was determined to get to the bottom of this mystery. The simplicity of the “one sensor” drip loggers, which spend all of their time in sleep mode, meant I had a tool I could use for some process of elimination trials. So I made a few loggers that were identical except for the mcu and put them on my newly arrived µCurrent. But my initial results were all over the place. Some units slept at a nice comfortable 0.2 -0.3 mA, while others drew about 2mA, and a few pulled 5mA or more. That last one is my spare flow sensor, and it came in around 5 mA , apparently confirming the high power use seen in the latest field deployment data. But five milliamp! Was that thing even sleeping at all? I started wondering if adoption of the Rocket Scream sleep library meant that some of the boards were not sleeping properly, so I dug up the older non-RS code and ran those…nearly the same results, with about 0.03 mA more current because because I was not shutting down the BOD in the older sleep routines. But that small consistent difference told me that the units actually were going into sleep mode between sensor readings, so I went back to my original thought that voltage regulators were my energy vampires. So counterfeit SD cards were causing the high sleeping currents! Looks like I have been sold several batches of bad cards from eBay, which do not go into the low current sleep mode I was expecting from the Sandisk spec sheets! (typically around 0.15 mA (see sect2)) When I tested each of the cards I have on hand, the Rocket loggers gave me sleep currents ranging from 0.24 to >5mA, with a cluster around 2mA, and another around 4-5mA. This does not seem to be related to whether the card is 64, 128 or 256 mb. I don’t see really bad screen printing but there are differences between cards with the same branding. To be honest, I figured that these small cards are so old, and worth so little money that nobody would bother cloning them. I was wrong. If I can’t locate a reliable source for small low sleep current SD cards, I will look into Solarduino’s solution of putting an N-MOSFET on the ground line. A few folks have pointed out that might not be quite as easy as it sounds to turn the power to an SD card on and off like that: “because SD.h wrapper for SdFat has a bug that prevents multiple calls to begin()”. What I really want is a system that protects the data by cutting the power to the SD cards whenever the power supply falls low. I would like this control to latch off (in case there is battery rebound), and use an “independent” circuit that relies on passive components. I have some homework to do there because you obviously can’t pull the plug when you are in the process of actually writing to the SD card. I know from my Vcc logs that the new file creation event is biggest sustained load on the system – making it the thing most likely to trigger the cut-off if the mcu is not in control. So I need to do a few tests to see how this helps lower the sleeping currents on my old small SD cards. After testing the 64, 128 & 256 mb cards I bought from eBay, I have found that if you have the “good” SD cards, the Rocket based loggers generally gravitates towards 0.2 mA or less, even if connections 8 & 9 are floating. However many of my cards do need pullups (0r pulldown) resistors on the two data connections that are not used for SPI to keep them from floating, or the sleep currents are much higher. 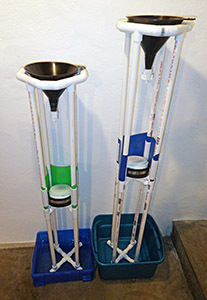 In the forums (and the datasheets) people seem to be recommending 50-100K pullups. I tested about 50 cards, and general result is: If this logger system+Sd card sleeps around 0.22mA with the pins floating, I already have a “good” card and pullups won’t change the sleep current by much. However about 1/2 the time a pulldown increases the sleep current of a low power sleeper, sometimes adding as much as 0.6mA (so total sleep current goes to about 1 mA). If there is no rise, then sleep current is unaffected by the pulldown. If my system draws between 0.5 mA to 2mA with the two pins floating…then a pull down resistor on those two lines will usually brings the whole system down to about 0.25-0.35 mA sleeping current. A pullup does not change the sleeping current of these bad cards quite as much, usually reducing sleep currents by about 1/3-1/2 as much as a pull down. So preventing the pins from floating is always good to reduce sleep current, but the worse a card is when pins 8&9 are floating, the more likely it is that pulldown will help it more than a pullup on those lines. This is very odd because no where in the data sheets does it specify to use a pulldown resistor. I am setting my pass/fail point for the entire logger at 0.33 mA, and if I don’t get to or below that with either pullup or pulldown, then I’m calling it a bad card and I won’t use it. If the “sleeping system” current for this logger design is above 2 mA with pullup/down, then I have a REALLY bad counterfeit microSD card, and I just throw it in the rubbish bin (which happened to about 6 out of 50). The WORST cards of all bounce down to a reasonably low sleep current when the system first goes to sleep, and then slowly increase over the course of 2-5 minutes, as I am watching the meter, even though the logger is completely asleep. Those cards seem to “creep up”, whether I put a pullup, or a pulldown, on the unused lines. What’s interesting is that they don’t “jump up” like I would expect if they were waking …they just slowly increase the draw bit by bit. Of course I am watching this with a plain old multimeter, so I am only seeing “the average”. Perhaps its a whole bunch of wake/sleep cycles in some kind of self triggering loop? I found 4-5 of these (of 50) and I am assuming that the card controller itself is NFG. A couple of these eventually went over 5 mA before I lost patience and just pulled the plug, but I might go back and let them run later to see how far they go. It might even be handy to have a duff card like this around when I want to bring the power supplies down to test power fault handling. Generally, if I have a good card, it goes into sleep state as soon as the MCU sleeps, and you can see that on the meter because the numbers are completely stable right away. The crummy cards seem to wander around for a while, like they have to think about whether they actually want to go to sleep or not. Some keep on jitterbugging, even after they have gone into low sleep current territory. So far, I’d say about 50% of the cards from eBay have been ok, with the ones being sold as “used” being much better than the “new” ones. Looks like I am not the only one who has had to grapple with SD card power issues. Luke Miller, over at the Open Wave Height Logger project, spotted another more subtle power problem with some SD cards using his oscilloscope. The new SD cards that he tested were drawing about 200 uA, which sounds much worse than the 60-70 uA Muve Music SD cards I am been using. But his loggers operate at an incredibly fast sampling rate, and that means time to sleep is just as important as the actual sleep current. Until I get my hands on an old scope and see for myself, I need to consider the possibility that the cards I am using might not be as good as I think they are…. I found that enabling these three internal 20K pullup resistors raises sleep current by between 1-5 μA, so it should not hurt your power budget too much, and could potentially save far more power by helping the SD cards go to sleep faster. This entry was posted in Reducing power consumption, Test results & Data analysis on September 22, 2014 by edmallon. The vertical lines here represent one month of operation, and Unit 4 (above in orange), which gathered almost 45000 samples in that time, projects out to another two months of operation. Despite a boost from slightly newer batteries and a longer 15 minute sample interval, the Unit 3 projection (in yellow) has almost exactly the same amount of time left on it’s 6x AA power pack. This would seem to imply to me that the quiescent current draw of my data loggers is far more important than the power used to drive the sensors. If I just do a quick ‘back of the envelope’ here, and I assume that the six AA’s deliver about 2000mA each, we are burning through 12000 mAh in about 5200 hours (est.at 7 months) = 2.3 mA average current. Ouch! Even with ~400 000 sensor read/record cycles it operated for almost four months – more than half of my lifespan projections for unit 3&4 and it was running on only 3 AA batteries. I had assumed that much bus traffic was the biggest load on the system by far, but perhaps it is time for me to re-consider things? 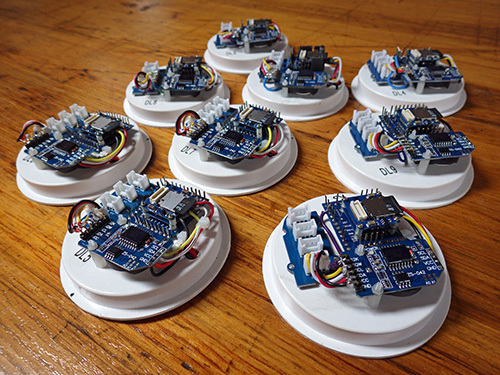 The Tinyduino sensors each have a regulator, as does their Sd shield…have I been ignoring the forest for the trees? At 11 months this just squeaks back in my design target of one complete year of operation. 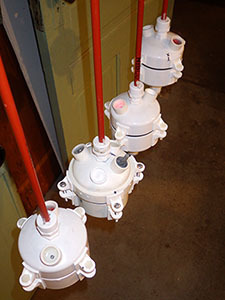 Any regulator, even one with relatively low quiescent current, will draw at least as much juice over time as any of the bits you are actually powering with it in a long term application like a data logger. I might also need to take another look at the losses on the Shottky diodes isolating the battery banks, because even with all those regulators in play we are no where near spec sheet predictions here. I needed better acclerometer sensitivity,so the new Cave Pearl builds have the sensors moved away from the main stack, and all of the power for the I2C bus is now runs through the single hacked light sensor board, similar to the stationery unit above. While power was not my primary reason for doing this, I suspect this was the right way to go for power managment in the overall design. And finally, the drip sensors have only one single regulator in their build, with the Sd card hanging right off of the pins. And now I am playing with BOD fuses, probably exposing my precious data to even more hazard. 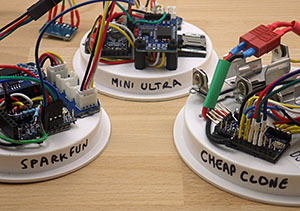 But it just might be that the humble three component logging platform actually surpasses the TinyDuino logger units, in terms of power use over time. After some months of waiting, my eevblog µCurrent is finally on it’s way, so I will have more power test results to report soon. In future, I will do my bench tests with two identical units, one of which will do sensor readings, etc., as normal, while the other one simply sleeps the whole time, so that I can isolate where the power is being used. There have been quite a few field trials since this test was done, and the short version of the results is: TinyDuinio based loggers draw about 0.065 mA sleep current, which on a 6x AA battery pack will get you between 6-9 months of run time. Loggers built with generic pro-mini style boards draw 0.33 mA which will deliver the same 6-9 months of run time on 3x AA batteries. Having good low sleep current SD card is critical to the success of your data logger and you really need to test to make sure your sensors are going into low current sleep modes as well. Cheap eBay sensors from China often fail this test. This entry was posted in Reducing power consumption, Test results & Data analysis on September 21, 2014 by edmallon. I have been doing run tests on the newest flow sensor builds, and this morning I had a little red error-state led waiting for me on a sensor that I had assembled the night before. I assumed I had botched a solder joint, or broken a wire somewhere while loading everything into the housing, but instead it turned out to be another Duracell battery failure. The logger recorded about 500 samples before going into shut-down mode. 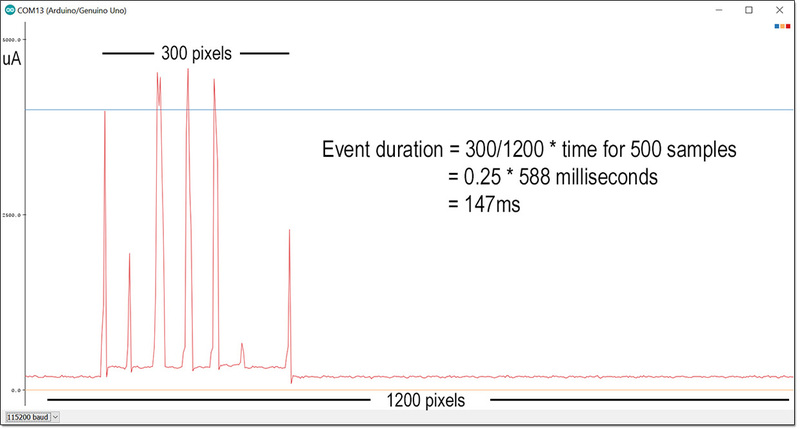 My overnight runs race along at one sample recorded every 15 seconds just to give them a workout, so this graph only represents about two hours of operation. 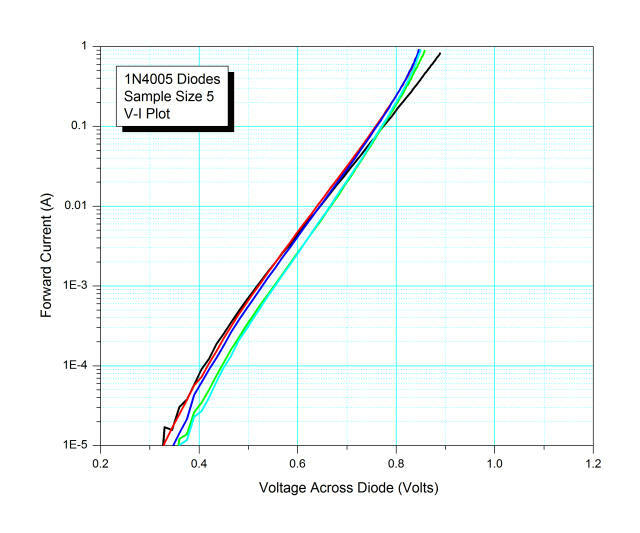 But still, that is one weird looking voltage curve (…especially with those ‘gaps’, and the voltage was increasing??). Since I have not seen one like this before, I thought I would post it here. The power module has 2 banks of 3AA batteries, isolated from each other by shottky diodes, so this probably represents one set trying to keep the logger alive while the other bank went down hill (while venting internal pressure?) Then when the bad battery leaked enough, the alkali affected the others, and the whole power supply pooped out. I don’t know why the logger stopped at this point either, as all of these voltages were within the units operating range, so I have to suspect that some kind of “burst” occurred around record 500, that pulled the voltage down below the 2800mV sleep trigger in the code. 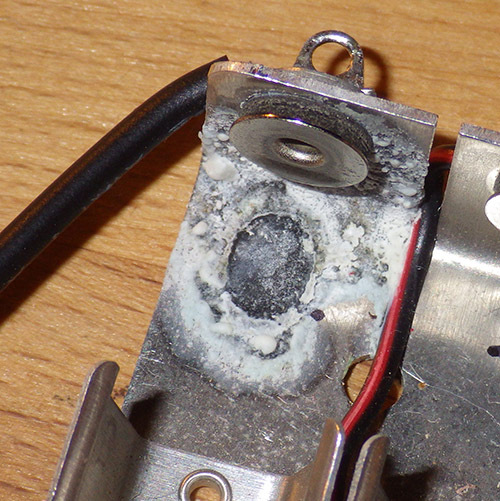 Certainly there was battery goo sprayed all over the inside of the housing. The cells that leaked were still delivering 1.3 volts each when I pulled the unit apart in the the morning, so this certainly was not caused by running the cells dry. My current hypothesis is that the new Keystone Electronics battery holders are so strong, that they are exerting pressure on the battery housing causing some kind of containment failure. Until I get a handle on this, I will have to go hunting for a replacement brand before the next field deployment. P.S. The Tinyduino logging platform seems to have survived the event, and is now ticking away in the basement for a proper shake-down run. This entry was posted in Test results & Data analysis on August 22, 2014 by edmallon. As I ramp up production for the next round of deployments, I am happy to report that the new crop of logging platforms have all passed bench testing (set RTC, r/w EEprom, r/w SD card, I2C bus coms, etc). As I have mentioned before, lifting the tiny light sensor board lines is a bit hairy, so I was expecting at least one of these to crap out due to bridging, etc on those tiny traces. To give them a more realistic workout, I will rotate through these units as I integrate the new sensors into the main codebuild over the next week or so. Hopefully after that I will have enough time for some proper burn tests before we go into the field again. 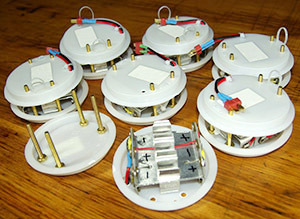 The 171 holders have so much tension, it can be a little hard on the fingers putting the batteries in! There have also been a few tweaks to the power supply modules: I am now using either brass, or nylon bolts wherever possible, and the plastic battery holders have been replaced with aluminum ones from Keystone Electronics. These holders are easily the strongest ones I have ever seen, should be rugged enough to withstand some serious knocking about. I still have not really tackled the hard & soft iron calibration issue yet, but hopefully the removal of the stainless parts used in the previous builds will assist compass calibration when I get there. Still running everything through Shottky diodes, but I have switched over to “Deans” style power connectors after searching the quad-copter forums for something more robust. This entry was posted in Test results & Data analysis on June 19, 2014 by edmallon.